The Walla Walla Vally Academy faculty are committed to providing the highest quality instruction and promoting excellence in scholastic standards. To meet this, a class program is tailored for each student to fit his or her ability level, talents and interests, as well as meets Washington State graduation requirements. All students are expected to maintain positive academic growth each semester to retain attendance privileges. 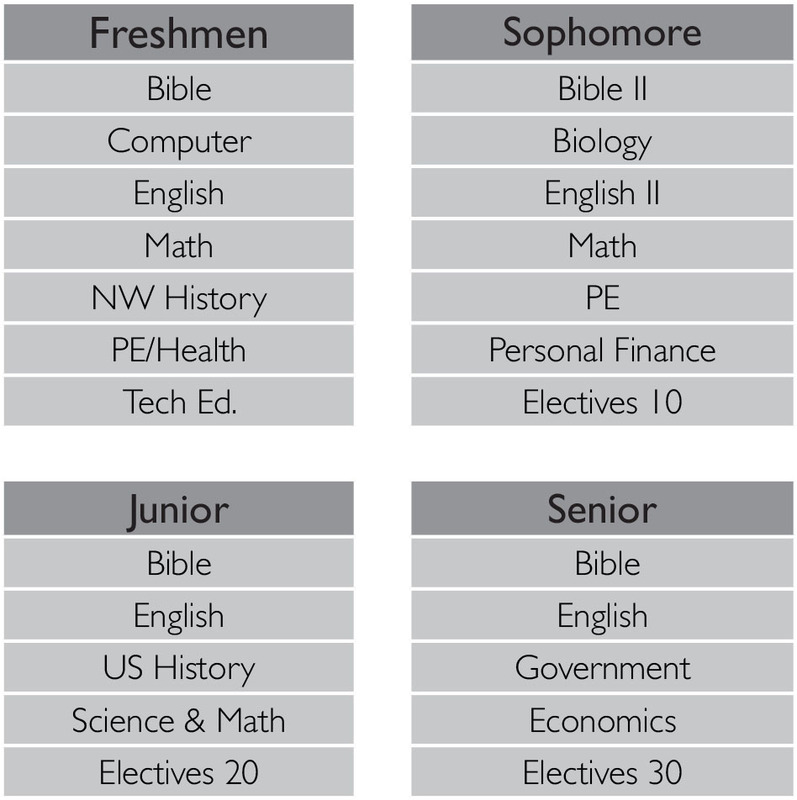 The high school academic program is based on a four-year sequence. Walla Walla Valley Academy offers three diplomas with varying credit requirements, which create opportunities for students to excel. A general diploma requires a student have a minimum of 230 credits. Enriched and College Prep Diplomas require 270 credits with a minimum 3.25 GPA. Students should be aware that graduation requirements are not the same as college entrance requirements. This is why careful planning in conjunction with the Vice Principal for Academics and Faculty Advisor is necessary for the selection of yearly coursework. 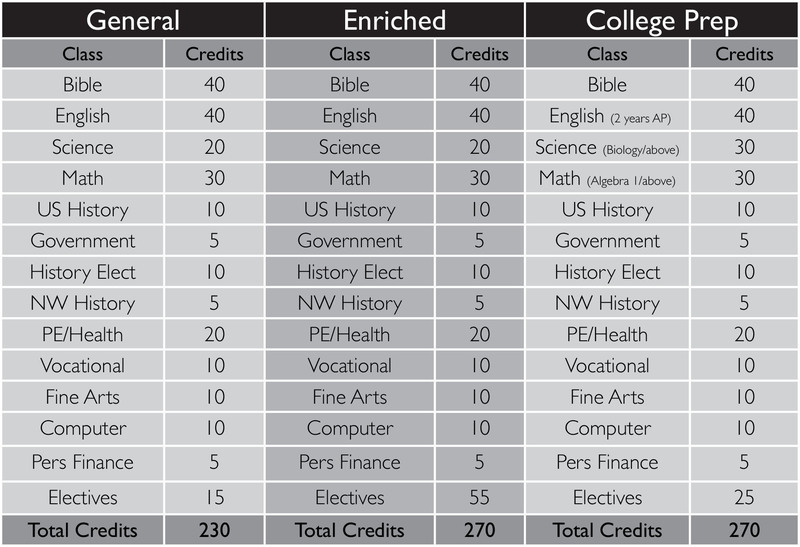 In addition, each student is required to earn five credits of Bible for each semester she/he is enrolled. Bible classes are to be taken from a WWVA instructor or through Griggs International Academy. Units of Credit: Five credits are granted for a class that meets for a minimum of 225 minutes per week for 18 weeks. Ten credits are equivalent to one Carnegie unit. Enriched Diploma Specialization: Five credits are granted for a class that meets for a minimum of 225 minutes per week for 18 weeks. Ten credits are equivalent to one Carnegie unit. Talk to the Vice Principal for Academics or respective department instructor for enrichment requirements. Class Standing & Eligibility: The number of credits a student has at the start of a current year determines class standing: Sophomores 60, Juniors 110, Seniors 160. A senior who comes to WWVA requiring 70 credits or more will be classified as a junior until grades are re-evaluated at the end of the first semester. At that time if she or he is passing appropriate courses and on track to graduate, she or he will be moved to senior class status. A maximum of 55 credits of music and physical education/health may be allowed toward meeting minimum graduation requirements. No more than 35 credits are allowed in either area. In addition, part time students are not eligible for varsity sports. Graduation Requirements: Participation in commencement is contingent upon a student successfully completing all required and elective courses necessary to earn the minimum number of credits for a general diploma. Seniors must be taking a minimum of six classes, exclusive of teacher assistant, work assignments, and off-campus credits, during the second semester to participate in graduation services. The Academic Standards Committee must approve exceptions to this policy. Grade reports of scholarship are mailed to parents/guardians at the close of each nine-week quarter and available via the internet for each class. Parents are invited to examine these reports and to contact teachers or the Vice Principal for Academics with any questions concerning the grades received. Only semester grades earned by the student are final and recorded on his/her transcript. Terminology: GPA is Grade Point Average. Current GPA refers to the GPA earned during a Quarter or semester. A cumulative GPA is your accumulated GPA. Honor cords and Enriched or College Prep diplomas will be determined by the academic standing at the end of the seventh semester. High honor cords are reserved for those with a cumulative 3.75 to 4.00 GPA and honor cords are for those with a 3.50 to 3.74 GPA.